Savvy small-business owners know that leveraging a holiday can be a cost-effective strategy. Whenever you can tie your marketing and advertising strategies with an event, such as Valentine’s Day, you’re sure to bring in some extra revenue from it. Rather than buying something for each other, couples enjoy experiences. Whether you sell a product or a service, offering something that can only be redeemed as a pair is an easy choice for couples. Throw in an additional item redeemable with the purchase – such as dessert at the end of a two-course meal deal, or a unisex massage oil after a spa treatment – and it becomes hard not to buy. You could also offer a “His and Hers” pair of products. People might say it’s the thought that counts, but those people are liars. This holiday, it’s the gift that counts. No one wants to be the loser giving or receiving the same gifts as everyone else: teddy bears, chocolates and flowers. What’s special about that? People probably want something more meaningful, something that obviously took some time and effort, with a bit of added creativity. It’s no wonder that DIY Valentine’s Day Gifts are one of the most searched items during February. Help your customers create something extra unique with a step-by-step guide, how-to tutorial or kit, using only your products or services. Not everyone celebrates the holiday with a significant other – and some even call it “Single’s Awareness Day.” Majority of businesses advertise to couples, and forget about the many more singles that want an excuse to celebrate their independence. 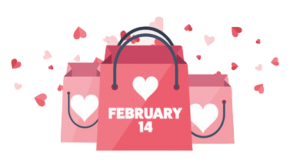 Single or not, show your customers and their single friends (your future customers) some extra love on the day they might be feeling a little less of it. Better yet, offer an incentive for being single, such as showing a photo of an ex to redeem a special discount. Make sure your offers make sense for your business – if you’re a jewelry store, it’s probably a better idea to offer deals for couples instead of singles. On the other hand, if you own a sports bar, you probably wouldn’t put on a special evening dinner for couples. Shooger helps businesses flourish in their local communities by providing them the necessary tools to monitor their reviews, manage their reputation, expand their online reputation and outrank their local competition. Contact us to learn more about what you can do to grow your business. Did you know, most small businesses bring in 20 to 40% of their annual revenue during the last two months of the year? Let’s make sure you do too, with these quick tips. People LOVE bundles, and it’s because it always increases the perceived value of what they’re buying. Businesses who offer bundles often advertise them with price points that inspire shoppers to buy for someone specific. Using phrases like “10 Things She Will Love for Under $10” or “$20 Secret Santa Gift Ideas for Coworkers,” businesses inspire and entice consumers at the same time. Take for example how grocery stores sell bundles by flavor or type of meal, while a skincare line might bundle cosmetic items. Retailers present promotions to redeem full-size products from purchasing a bundle of minis. It works in any industry, and businesses can use bundled items to introduce new products while securing increased sales. Do you have loyal customers or people who subscribe to your email offers? It’s important to run promotions to gain new customers, but it’s just as important to keep the same happy customers coming back. Reward them with loyalty programs by exclusively sending offers that sound something like, “40% off your purchase of $50 or more ONLY for loyalty shoppers.” You could also offer additional points that are only gained during the month of December, giving holiday shoppers additional redeemable points for purchasing during the holiday month. No matter what type of business you have, almost all consumers use at least one social media platform. According to the Pew Research Center, 90% of adults use social media and those with higher incomes lead the way. Don’t you want to make sure your special offers are visible and seen in as many places as possible, to as many people as possible? Being present on social media not only expands the reach of your offers, but each offer can also be shared repeatedly with prospective customers you may have never reached otherwise. With Shooger, you can send holiday offers through email and even social media within minutes. Use bold, eye-catching images to grab the attention of new customers. To learn more about how easy creating and sending your promotional offers can be, contact us. Please feel free to contact our support team with questions and concerns at any time. Email us at support@shooger.com or call toll free at 1-888-606-4738. Log into your merchant account at Shooger.com. Click on – under “create Campaign – select a campaign type” section at the top. This will take you to a page where you can begin creating different types of offers. Note the character count on the Offer Name and Description. This is designed to keep the information short and sweet, so your prospective customers become engaged and the offer grabs their attention. Notice on the right that you can schedule your offer to expire. We do recommend doing this as an offer that expires typically entices a prospective customer by giving them a sense of urgency. We’ve also given you the ability to make your offers even more engaging with added visuals. If you want to upload a photo, simply load it from files on your computer or phone. If you want to upload a video, you will be asked to input a “Video URL,” and you can get a URL by uploading your video to YouTube, copying the embed link and pasting it into the field. If you have any policies or legalities your customers should be aware of, the “Fine Print” field is where you should place this information. You can your hide your offer by check-marking “This is a Hidden Offer.” This means your offer will not be promoted on social media or on the Shooger Network, but can still be sent to all your current subscribers. We encourage you to rarely use Hidden Offers, as promoting your offers on social media and on our network will help your local visibility. At any time on your account, you can click this icon, which will typically provide you with added frequently asked questions, tips, and best practices. If you have any questions or need some extra help with a section or type of offer, please contact us. We want to help! Go ahead, create and offer and send it to your subscribers now! 1. Sign into your account at shooger.com using your username and password. 2. You will automatically be brought to your dashboard. 3. On the left side, click on Subscribers. 4. Notice that the tab that is automatically selected is “My Subscribers.” This is where you will always find all your current subscribers. 5. From here, you will click on the “Add Subscriber” button on the right side. 6. This will pop-up a screen asking to input personal information. 7. We recommend filling out as much information as possible to give you the best data about your subscribers. 1. Follow steps 1-4 from above. 2. From here, you will click on “Import Subscribers” button on the right side. 3. This will pop-up a screen. 4. Upload your list using a .CSV or .TXT formatted file. 5. Once you select your file, click import on the right. *Note: Your subscribers will be sent a confirmation and may not appear immediately on your list. If your business has multiple locations, please don’t forget to choose a location to ‘link’ your subscribers to. .CSV files can be created in Excel, using the Export to .CSV function. If you use .CSV, please make sure that only email addresses appear in the FIRST column of this file. All data contained in other columns will be ignored. .TXT files should contain only 1 valid email address per line and should contain no separating characters such as commas, or periods after each line.